The newly designed smart soccer ball, Ctrus, took home this year’s Red Dot concept award. Designed by the Mexican studio, Agent, the concept was created to reduce referee errors, which have been a problem for years in the sport, as well as providing fans and team managers a new perspective. Ctrus, has the ability to light up different colors when a ball goes out of bounds, crosses the plane of the goal, and when nearby players commit certain fouls such as offsides and other penalties. This new technology to the face of sports would bring fans closer to the sport than anything before it. 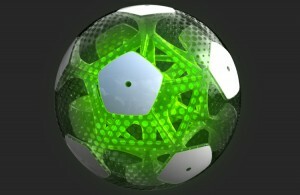 The ball would be loaded with RFID chips and GPS tracking to essentially give the ball a brain. This airless ball is covered with reinforced-elastic mesh giving it the same bounce as a standard soccer ball. As of now the ball is only in conceptual stages but plans are to take the ideas to the next level. This creation has the ability to change the game of soccer for players, team management, and fans alike. This idea can not only take off in soccer, but imagine what it could do for other sports as well. I don’t think referees will ever be eliminated from any sport but here is a start to ensuring accuracy in the calls. CTRUS – Envisioned by AGENT. from AGENT. on Vimeo.